One of the most currently fruitful areas for anthropological explorations of human/ nonhuman relations lies in the plant world. In this panel discussion, archaeological, social/cultural, medical, and linguistic anthropological perspectives intersect in exploring how humans perceive, sense, build, nourish, and heal with plants in fashioning distinctand sometimes conflictual or fatal ways of being in the world. 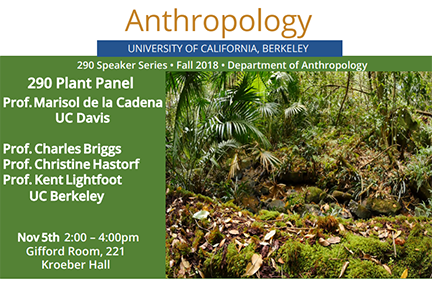 Interactions between indigenous and non-indigenous plant-related perspectives and practices in California and South America will figure centrally in this discussion between UC Berkeley faculty members and special guest Prof. Marisol de la Cadena of UC Davis. Prof. De la Cadena is professor in the Department of Anthropology and the Department of Science and Technology Studies at UC Davis. Her scholarship interests include the study of politics, multi-species (or multi-entities), indigeneity, history and the a-historical, world anthropologies and the anthropologies of worlds. Prof. De la Cadena is the author of Earth-Beings: Ecologies of Practice Across Andean Worlds (2015 Morgan Lectures Series-Duke University Press), Cosmopolitiques dans les Andes et en Amazonie: Comment lAutochtone politique influence-t-il la Politique? with Jorge Legoas, special issue of Recherches Amérindiennes au Quebec Vol XII (2-3), and Cultures of Race and Hybridity in Latin America ( 2011 SEPHIS-CSSSC, Netherlands, Calcutta).